Wayne State’s TechTown is helping Detroit thrive again – starting with the city’s low-tech infrastructure and encompassing the whole picture of the economic ecosystem. Driving into downtown Detroit commuters are greeted with extremes. From the impressive towers of the General Motor’s Renaissance Center to the abandoned and decaying factory buildings, Detroit has every sign of a once great city that has fallen and is rapidly rising again. But the city is missing one thing: infrastructure like grocery stores, dry cleaners, and shopping centers that will attract people downtown. Through its aggressive entrepreneurial initiative, Wayne State University’s TechTown is bent on stopping the recent trend of outward migration, according to Leslie Smith, General Manager of TechTown. Since its establishment in 2004 as Wayne State’s research and technology park, TechTown has done more than provide assistance to large companies in the science and technology sectors. 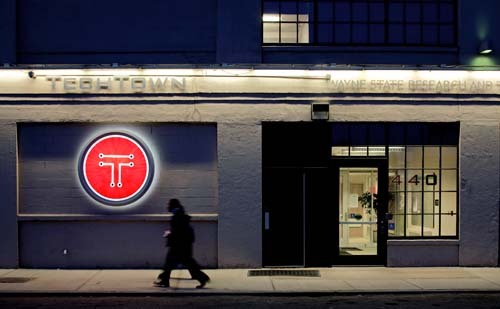 In light of the city’s unemployment rate, changing the face of outcomes for Detroiters largely through entrepreneurial job creation has been the largest initiative at TechTown, according to Smith. “Instead of wallowing in the perspective of the nation, we’ve decided to be actively engaged in a solution. We like to think that we’re innovating around an economic development problem, and how we’re doing that is by creating programs that uniquely serve Detroit,” says Smith. Recently, the business incubator has placed an emphasis on micro-enterprises with initiatives like THRIVE, an entrepreneurial coaching program designed to help start-up companies with access to capital, talent, and business resources regardless of their stage in the business life-cycle. Ocie Irons, Director of Entrepreneurial Programs at TechTown, invests his hope in the long-term goal of improving Detroit’s economic ecosystem. “Our goal is to have [micro-enterprises] be stable so that they can support the longer term development of new businesses as well as relocation of existing businesses to Detroit,” says Irons. Although there is an extensive intake and application process, virtually no one is turned away from TechTown’s services. After an initial online application, entrepreneurial hopefuls are vetted to an Intake Champion who will assign them to the stage in the THRIVE program best suited to their phase in the business life cycle. Entrepreneurs are connected to an Entrepreneurial Champion to guide them through Kauffman Fast Trac training and several other THRIVE courses and workshops on topics like marketing and capital development. Participants are also given access to a Talent Champion and Capital Champion who serve as a liaison between the entrepreneur and access to capital, employees, and other resources. THRIVE currently has 150 members participating in the program. “When you show up, the goal is that we kind of wrap a big entrepreneurial hug around you and walk you through the paces and challenges of early stage company creation,” says Smith. Francine Wunder, Director of Corporate/Public Affairs for Wayne State University and TechTown, sees TechTown’s mission as extending beyond its traditional purpose of serving as an incubator for high-tech companies like Asterand, Inc. and the Michigan Neonatal Bio Bank. TechTown’s call to action goes beyond innovation and provides an avenue for reinvention — high-tech to no-tech. “TechTown is inclusive and diverse in the sense that entrepreneurs can come here and regardless of whether they’re the next Google or a small micro-enterprise business like a coffee shop, we are going to try to help them with the resources that they need to succeed — talent, coaching, funding — we take them under our wing and try to help them,” says Wunder. According to Smith, TechTown’s initiatives for entrepreneurs embody the “Detroit spirit to never die.” In addition to THRIVE, TechTown offers programs like THRIVE One, designed especially for women and minorities, ShiftingGears, a program designed to re-position ex-auto executives, and FirstFridays, networking events offered to Detroit’s entrepreneurs at the start of each month.